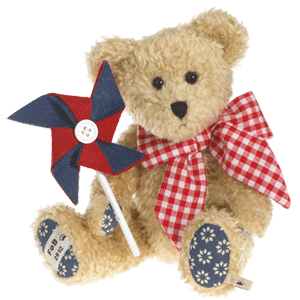 Boyds by ENESCO feature a range of plush bears and bear figurines. ENESCO acquired the brand to their portfolio in 2008, but the concept started some 25 years earlier in 1979 with Gary M. Lowenthal and his wife, Justina Unger. They ran a ‘small antique shop’ in rural Boyds, Maryland and began to make and sell antique reproductions, including a line of duck decoys. In 1984 they began sculpting in resin, initially making a line of miniature houses called “The Gnomes Homes”. The first bear was a stuffed bear made for the couple’s newborn son, Matthew. They began making and selling stuffed bears, and the bears became known as “Boyds Bears”. 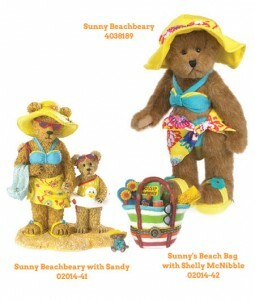 Pictured right: Part of the 2014 Friends of Boyds (F.o.B) Club Kit – 8″ plush bear Sandy Seashell and 3″ miniature Bearstone® figurine – Sandy Seashell…Buckets of Fun. The bears developed into Boyds bearstones in 1992, a line of resin bears which became one of the most popular collectables at the time. The Boyds Collection of plush teddies had long been popular with teddy bear collectors, and when the first resin bears appeared there was already a large market. The bearstones were an instant hit with collectors and the last few years has seen a dramatic increase in collecting these bears. Boyds founder, Gary Lowenthal, suggests part of the success of the bearstones is that they avoid many of the “traditional cliches of most teddy bear manufacturers”. The bearstones include Christmas ornaments, waterballs, and bears and friends in various scenes. Many of the bears appear in several pieces, giving them more character. The bearstone also evoke a great deal of humour, such as Otis the Tax Collector. Who would have thought a tax collecting bear would be popular? Many of the earlier retired bearstones are very collectable and already sell for many times there original purchase price. There is also interest in earlier numbered versions of bearstones. 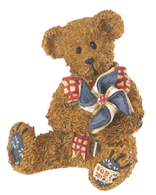 Gary Lowenthal retired form the Boyds Bears scene in 2000 and the brand was acquired by ENESCO. 2014 Members-Only exclusives information; and a Decorative box with fun, beach-themed graphics. NOTICE – This site is not affiliated or associated in any way with Boyds TM. The purpose of these pages is to provide information to collectors of Boyds Bearstones TM.